Alexandria - Alexander named no fewer than 30 cities after himself (his ego was no doubt up there with Ramses'). The most famous though is easily Alexandria...um, the one in Egypt. Alexander conquered Egypt in 331 B.C. without a fight. After Issus, the Persians were unable to defend it and the Egyptians welcomed him as a liberator. They proclaimed him pharaoh and god, calling him the son of Ammon. After that, one of his adopted titles was, "son of Ammon-Zeus" (as the offspring of the highest deity in both the Egyptian and Greek pantheons). Apparently, since there was nothing to conquer, Alexander instead devoted his energy to building. He found an ideal location situated on both the Mediterranean coast and western side of the Nile delta. To the south was Lake Mareotis which was fed by the Nile and provided a source of fresh water for the city. The ancient Egyptian town of Rhakotis was already on the site and had been there since about 1300 B.C., but Alexander decided he wanted to do a reboot. His architect, Deinocrates, went to work designing the layout. According to legend he resorted to using barley sticks after running out of chalk. Birds came along and devoured the barley, and Alexander took it as a bad omen. But Egyptian priests assured him it was a favorable sign. Deinocrates designed the city in a classical Greek rectangular style. A main street running parallel to the sea for three and a half miles, intersected by a north-south strip. As it grew, it became divided into five quarters, named after the first five letters of the Greek alphabet. A canal ran from Alexandria to the Nile, providing water into the city and transportation out of it. Alexander left Egypt in the same year he entered and never returned, except to be buried there. He never saw how great his city became. Within a single generation it grew larger than the city of Carthage, and in Roman times it was the empire's second largest city, next to Rome itself and served as its bread basket. But even more impressive was Alexandria's cultural and intellectual legacy. 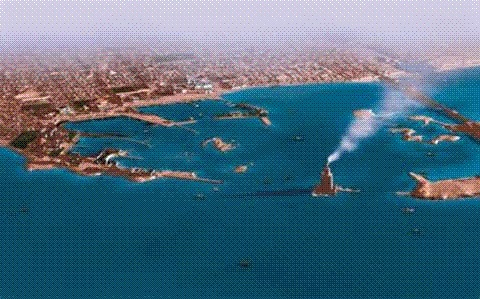 It became home of one of the Seven Ancient Wonders of the World, the Pharos (lighthouse) of Alexandria, and the repository for the greatest collection of knowledge in the ancient world, the Great Library. Great minds from throughout the Mediterranean migrated to the city to study all manner of arts and sciences, and it became an important center for Judaism as well.